My brilliant thoughts about current, past, and future events. You are welcome. Sarah Palin Speech Preview – No Teleprompter, Blindfolded, Earplugs. 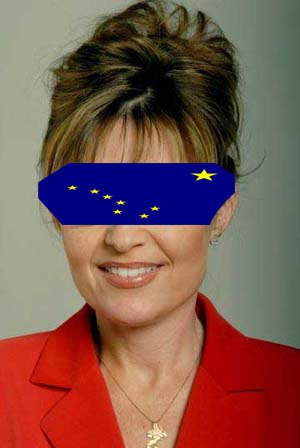 Republican party officials confirmed today that Vice Presidential nominee Sarah Palin will present her speech this evening using no teleprompter and while wearing a Alaska State Flag blindfold and earplugs. Palin did meet the cousin twice in the past five years at two separate family gatherings and is said to have said “how are you?” to the younger 25-year-old cousin, causing concern within Republican ranks that the Alaskan Governor is too closely tied to her cousin, who has no plans to move to a larger living space. thanks for reading, commenting off-topic (did I write about John McCain in this post? ), and mentioning your 9/11 website, as you do at every site you visit, apparently. I think my post and this site is way over your head, as you missed what was supposed to be a slightly amusing dig at the press and outlandish expectations for the speech.